The Suisun Valley Inn is an intimate retreat at the historic 27-acre Monroe Ranch in the heart of Suisun Valley, just east of Napa. Accommodating ten guests in five suites, the inn is the ideal location to stay while enjoying the area wineries, farms and attractions. The Suisun Valley Inn is an intimate retreat in the heart of our valley. Designed to resemble George Washington’s home at Mt. Vernon, the Inn is the former principal residence at historic Monroe Ranch. Surrounded on all sides by vineyards or farmland the Inn is tucked up against Suisun Creek which provides a habitat for over forty species of birds. At night, amateur astronomers can easily identify dozens of constellations moving across the sky. 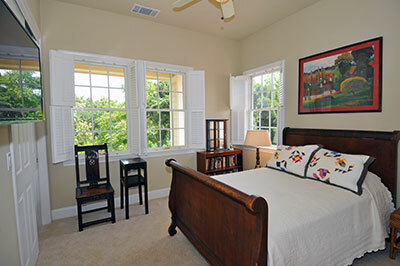 Each of our five guest suites is its own cozy sanctuary away from the hustle and bustle of everyday life. The George Washington Suite and the Dr. Sun Yat Sen Suite, each with its own bathroom are situated on the ground floor, while the Chardonnay Suite, Suisun Creek Suite and Twin Sisters Suite share two additional bathrooms on the second floor. All rooms have either king or queen size beds, and each room has a flat screen TV. We can accommodate up to twelve guests. Groups have exclusive use of our fully equipped chef’s kitchen and our dining area can seat up to fourteen guests. There is an outdoor grill, fire pit, gazebo, horseshoes, badminton set and hammock which guests are welcome to use during their stay. We are within five miles of every winery, farm stand and restaurant in Suisun Valley, and within twenty miles of downtown Napa. Reservations can be made through Homeaway.com, Airbnb.com or by calling the Inn directly. We are open 365 days each year. We require a two-night minimum stay and three-night minimum stay on holidays. To arrange a personal tour of the property, contact Gary Bacon at (707) 864-3153 or email Info@SuisunValleyInn.com.